Winners: The two people who have won a copy of David’s book are @pinkchick and @Robert. Thanks to everyone who entered and I hope anyone who didn’t win will head over and pick up a copy of The Distance anyway. Have you ever wanted to train for a triathlon or Ironman, but just weren’t sure how to do it….or if you were even capable of doing it? Well, David Mills was in that same position and wanted to do something about it. He was an “Average Joe” and had no clue how to fulfil this mega ambition that he was after….but he did it. Now he shares his story in a new book called “The Distance”: A guide for all those people who wonder if they have what it takes to become an Triathlete or Ironman. Be sure to check out the details at the bottom of this post to see how you can WIN a copy of his book. The compelling path of an average guy who sets out to answer his haunting question, “Could I complete an infamous Ironman triathlon?” An honest guide to balancing family, work, and training with big dreams. Have you ever watched those crazy people on TV as they compete in an Ironman Triathlon? Have you ever wondered in the back of your mind if you could do that? What if you actually set out to answer that question? What if you did the unthinkable and actually registered for an Ironman? This is the story of an average guy who did just that. Like you, David Mills was scared of a speedo, refused to shave his legs, and didn’t have much time to train due to work, family, and…life. With a hectic job, two kids, and graduate classes at night, David learned to balance work, family and training to attempt the craziest ultra-endurance triathlon on the planet. 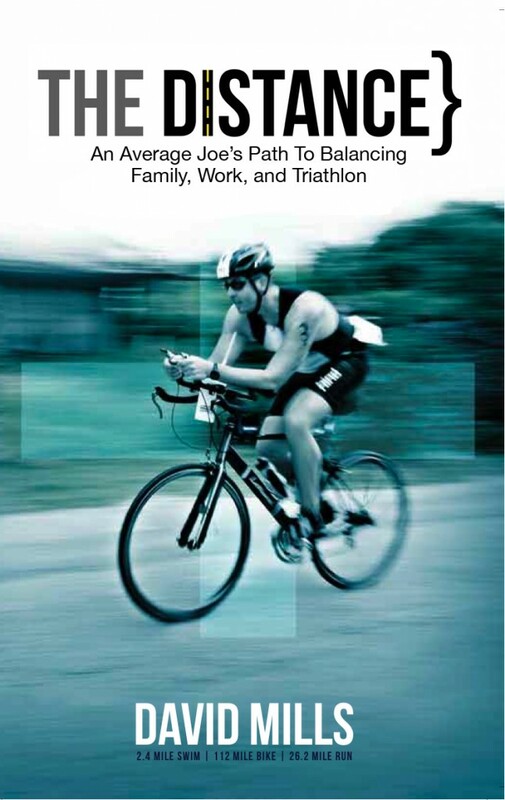 The Distance is not just another “how-to” book about triathlon training. It is the passionate and inspiring path for all “Average Joe’s” who have big dreams. It’s about how to balance those big dreams with real life. David will not only convince you that you can do it, he’ll give you the practical training tips to make it a reality. It’s the perfect blend of personal story and training guide. The Distance is a must for every Average Joe who hopes to cross a big finish line! David Mills grew up in North Carolina where he spent his days playing soccer and backpacking in the Smokey Mountains. After graduating from the University of North Carolina at Greensboro, David was commissioned as an officer in the U.S. Air Force. 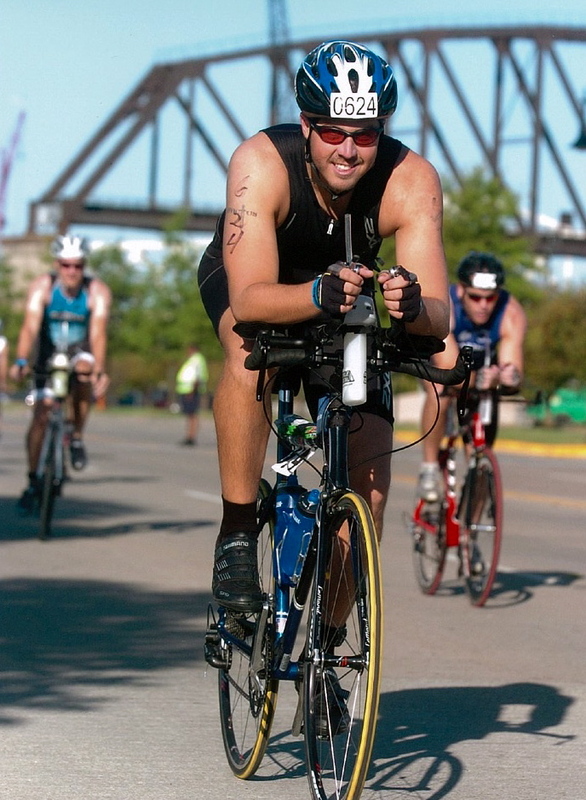 He tried his first (and then second) triathlon while stationed in San Antonio, Texas for navigator training. But it was during his three-year assignment to Okinawa, Japan that he truly fell in love with the sport and trained for his first Ironman. Now on his fourth deployment to the Middle East, David is currently training there for his second Ironman. You can get a free copy of David’s book just by commenting and letting us know why you’re interested in his story and if you have dreams of one day doing the same thing he did. Leave your comment below and on Monday (July 25th) we will announce who gets a copy of the book. We have a couple to give away so get your comment in by Sunday at 6:00PM EST and you’re in to win. I have no doubt that Rebecca and Heather will become Ironmen (Ironwomen?) if they decide to go for it. You’re absolutely right about it being all about a “strong mental outlook”. Like Yogi Berra said, “90% of it is half mental”. I hope you will keep me posted (on Twitter or FB) so I can follow you on your Ironman journey! An ironman is definitely a lofty goal. If it becomes something you want to shoot for, I wish you all the luck and encouragement to go after it. Three years ago I weighed 200 lbs. As a 5′ 1” woman, that doesn’t allow you to hide the weight well. I was mocked, bullied, and made fun of throughout high school. I joined the softball team my junior year to try to loose weight and just fit in. My softball locker posters were defiled though out the season, as unknown students wrote “fat a**” and “big mama” all over them. When I went to college it was the same type of atmosphere and my self-esteem was at an all-time low. That was, until my sophomore year when I met a soldier who was a runner and cyclist just like David Mills. He was the first person to see me as I was inside. He invited me to the gym, taught me workout techniques, and before I knew it, I had lost 20 lbs. I fell in love with this man and we became a couple. As we dated, he bought me a road bike and trained me. Three months later I did an 88-mile ride with his cycling group. I was losing weight consistently and I was finally able to like myself. I began competing in 5Ks and seeing true results in my athletic performance. When he proposed, I weighed 135 lbs and was able to buy AND wear the dress of my dreams! Now, we run, bike, and swim together constantly. My husband helped to literally transform my life. Now, I can’t live without fitness. It is everything! We are currently training for our first half-marathon. We plan to train for our first triathlons in the next few years and we both have serious goals of doing an Ironman. I am interested in David’s story because he is an inspiration! I would like a copy so I could not only learn how to reach my dreams from David’s experiences, but so I could share this story with my husband so I can inspire him the same way he inspired me these past three years. Thank you! Heather, that’s an awesome story. I wanted to thank you for sharing your personal story with us. This is incredible and beautiful. Sorry you weren’t one of our winners for the book giveaway, but I hope you’ll consider getting a copy for yourself anyway. Please be sure to keep us updated on everything and let us know if we can help out in any way. Heh, I’m just an ordinary gal. I got back into running in my 40s and was inspired to try triathlons in my 50s. I finally did my first one at 55, last year. Got hooked and did 4 in 2010. I did 2 this year and plan to keep doing them. Call me crazy but I do think about IronMan. Will I get there, only time will tell. In the meantime I keep training and trying. I’m not getting older I’m getting better. I’d love to read this book. Congratulations…you’ve won a copy of the book. Send me your contact details and we’ll get it out to you soon. Ordinary guy doing a Tri, top stuff, and a military feller too! I have a sneaking desire to do a tri when I finally finish my weight loss program. I was a half decent swimmer back in the day and as a Soldier (again back in the day) I had to run. So along with my biking I feel I would be equipped to do a short tri when I’m back at my fighting weight. Obviously I’d just be looking to finish not compete! Good luck with the book, if I don’t win then I’ll certainly grab a copy! First off, Mr. Mills, you are not an “Average Joe”. “Average Joe’s” are not commissioned as officers in the Air Force, Army, Navy, Marines or Coast Guard. You are entrusted as a leader of men, and as all good leaders of men do, you inspire. I too am on a journey and seek inspiration and motivation from wherever it can be found. I am interested in your story because for this reason. To learn the structure and discipline you employed, for tips and tricks to avoid the loopholes of life that often trip us up along the way to reaching our goals. Most of all, I would look forward to passing it along to inspire another once I’ve finished reading what I know is a fantastic story. Thanks for continuing to provide quality stuff for anyone, I aspire to be as helpful. Thanks Joel! I just checked out your website and I love your approach and inspiration. I hope you’ll enjoy and be encouraged by my book. My friend who cons me into trying crazy stuff is trying to con me into doing a triathlon with her. I’ve thoroughly enjoyed my midlife crisis so far, and I wonder if a triathlon might be icing on the cake. In nursing school, working full time, three kids under 12 at home, and interested to hear how to make that work with training! Dave – I just want to read the book!!!! The biggest thing that helped me with the swim training was a class that the local YMCA gave. The instructors gave us a workout Monday and Wednesday mornings and as we did the workout they helped me improve my form to the point that the swim which I thought would be the hardest event ended up being the easiest. Good to see you work through it and achieve success. Good luck in the contest. Congratulations on completing a half….and good luck should you choose to go after the full. You are amazing. Like many people when it comes to triathlons, I am apprehensive about the swim part. I have finished two sprint tris, and both times, I find that my mind fills with anxiety during the swim. I finish the swim part within my estimated time, which is good, but I always feel anxious and think that I stink at this part. I have friends trying to get me to do a half Ironman with them and I really, really want to!! Nice to hear from you and I hope you continue to get better and better. Go out there and get that half Ironman under your belt. Wow! I can say that regardless of winning this book or not, I will be getting it soon! This entire story sounds like my inner monologue for the last year. I am always eager to hear how others in similar situations like this manage the daily ebb and flow, especially when they can come out on top. You’ve got a history of winning over here so you never know. Thanks for your comments and enjoy the book…either way. OK so here goes. I’m interested to learn not only how he trained but how he found the time needed. I’m 44 years old, recently quit smoking, a bit overweight and have two small children ages 3 and 1 month. I purchased a bicycle with the hopes of getting back into shape but cannot seem to find the time. I dont want to miss my children growing up and starting their own lives. Thanks for sharing your personal story and this book sounds like the right thing to get you going. We’ll announce the winners on Monday. Good Luck. Congratulations @yahoo-AY5X4I2AYVSDOI24EWCWMCFQPM:disqus you are one of the winners in our “The Distance” contest. Please send your contact information to darryl@lovingthebike.com and we’ll get it out to you. Sounds like a great book. I can relate to him on so many levels – military officer, married, kids, hectic days and so on. I’m sure many of the other readers can relate too. Thanks Bryan……his story actually reminded me of you a little. I hope you get the chance to check it out. Hey @AverageIronMan:twitter – I’m still working on becoming an average marathoner, but in secret, a life goal of mine is to finish an Ironman and get the logo tattooed on my left calf. I like the idea of being “average” at a ridiculously BIG goal. Good to see your post here, David. I can’t wait to see that tattoo on your leg.